Today wraps up National Native American Heritage Month. November has been designated as a month to celebrate Native American Indian heritage and history since 1994. That’s great news for local history in Ohio, because this area has an incredibly rich and varied history of American Indian peoples, from nomadic hunters 15,000 years ago, through the mound building cultures between approximately 800 BCE and 500 CE, all the way up to conflicts between major American Indian groups and white settlers in the eighteenth and nineteenth centuries. So if you want to interpret Native American Heritage at your local history site, where do you start? I’ve tried to gather a few resources here for ideas and further research. This blog post from last year’s American Indian Week in Ohio gives a great starting overview of American Indian history in Ohio and points out some resources available on the Ohio Memory database. 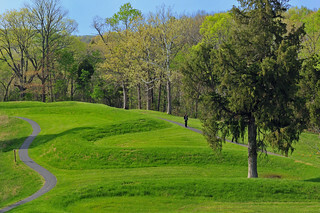 The ancient earthworks in Ohio are so significant that a coalition of organizations is nominating the Hopewell Ceremonial Sites in Warren, Licking, and Ross counties to become a UNESCO World Heritage Site. For general information about American Indian history and culture, check out the Smithsonian National Museum of the American Indian. They have everything from basic tips about language use to libraries of more in-depth resources. Another great resource is the National Congress of American Indians. Their publication Tribal Nations and the United States: an Introduction gives an overview of tribal governance – what that means and the history behind that relationship with the U.S. government. This collection of resources, shared by Teaching Tolerance, is geared toward classroom educators, but could be useful if you’re planning to do any programming with students. If you deal with American Indian history frequently at your local history site, Interpreting Native American History and Culture at Museums and Historic Sites would be a great resource for you. Part of the AASLH Interpreting History series, it will give more in-depth interpretive methods and case studies for incorporating American Indian history into your programming and exhibits all year long. Finally, keep your eye out for more ideas and more to learn.